The Akron Municipal Court announces that the first Forensic Assertive Community Treatment (FACT) program participant will successfully complete the program this month. 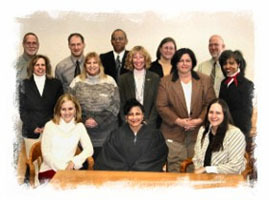 The Akron Municipal Court has partnered with Community Support Services (CSS) for the last year as a member of the FACT multidisciplinary team. The FACT model is designed to transition adults diagnosed with severe mental illness from correctional facilities into the community. The FACT program serves clients with lengthy criminal histories. The three core elements of FACT are: access to services, competent care and legal oversight. Most referrals to the FACT program are from jails, prisons or other criminal justice systems. The FACT team works in partnership with criminal justice agencies to manage clients. Certain risk factors such as substance abuse, family problems, lack of recreational pursuits and/or history of anti-social behaviors are targeted to prevent criminal recidivism. The Akron Municipal Court hired a new probation officer, Michele Franklin, LPCC –S, dedicated solely to the new mental health multidisciplinary team. The Akron Municipal Court created the position in conjunction with Community Support Services through a grant provided by the County of Summit Alcohol Drug Addiction and Mental Health Services (ADM) Board. The position is fully funded through the grant, which will reimburse the court for costs associated the with the FACT program. Franklin serves as the court’s liaison and participates on the FACT team. She is a licensed professional clinical counselor with extensive experience in the mental health and criminal justice field. She said she is happy to have the opportunity to combine mental health and criminal justice expertise. “There is still a struggle even with the great strides achieved to join the two fields to better serve the needs of the community”, said Franklin, who added she hopes to be an asset to the system and to make an impact on probationers who are mentally ill. She said she also hopes to provide structure and guidance to assist the probationers in getting back on track. Since Franklin’s first day at the Akron Municipal Court in July 2013, she has interacted with Community Support Services, Oriana House and ADM Board to set up appointments for offenders. She currently has a caseload of 23 probationers who have been enrolled in the FACT program. Each Akron Municipal Court Judge may refer an offender to the program for an assessment and determination of eligibility. Franklin explained that offenders who are eligible for the program have a lengthy criminal history and severe mental health diagnosis, such as schizophrenia, schizoaffective disorder or other disorders with psychosis. The Akron Municipal Court has an ongoing commitment to meet the needs of the community as reflected by its Mental Health Court which has been in place since 2001. Judge Annalisa Williams and the Akron Municipal Court were recognized in 2013 as the CSS Community Service Partner of the year. The Court believes the FACT program is a necessary step to ensure offenders obtain the mental health treatment they need to successfully meet the challenges they may face.